The robotized gearbox is a type of gearbox for automotive use whose name comes from the “robotization”, in other words the substitution of manual drives with automatic drives, of a regular manual gearbox. The electronic control unit independently carries out the clutch and gear engagement movements, by means of specific actuators. This control unit carries out the clutch disengagement process, the change in gear ratio and the subsequent clutch re-engagement. During this operation, a communication is sent to the engine control unit, through the CANbus network, to ignore the drive torque request coming from the accelerator pedal so that the revolutions decrease while upshifting or to accelerate the engine while downshifting. The Magneti Marelli robotized gearboxes feature hydraulic actuation of the movements, which is characterized by faster actuation sped and consequently improved sports performances and greater vehicle comfort. Strong of a longstanding experience in this sector, which began with the first robotized gearbox created for the Formula 1, Magneti Marelli supplies its robotized gearboxes to all manufacturers of super sports cars (Ferrari, Maserati, Aston Martin, Lamborghini and Audi), compact cars and commercial vehicles. Magneti Marelli’s robotized gearboxes also offer a dual operating mode: manual or automatic. In the completely automatic mode, the control unit is responsible for deciding on the gear change. In the manual mode, the driver chooses the gear to be engaged using a lever similar to the traditional one or by means of steering wheel controls or paddles. POSSIBILITY OF CHOICE: With the Magneti Marelli robotized gearbox, drivers choose the driving style, as a light touch of the gearshift lever is all it takes to switch from automatic mode to manual mode and vice versa, all without having to take their foot off the accelerator. Even in automatic mode drivers maintain control: by acting on the gearshift lever they can instruct the system on the desired gear. In addition, all the relevant information can be displayed on the dashboard to allow drivers to have control over the situation at all times. 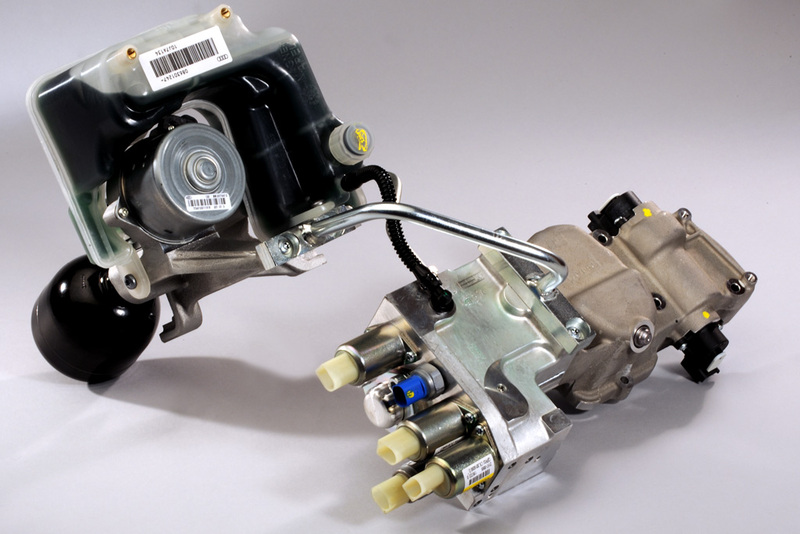 COMFORT: the Magneti Marelli robotized gearbox makes driving less stressful. In automatic mode, the driver can concentrate on driving without having to worry about shifting gears, while in manual mode its gearshifts are made easier since a simple touch of the lever is all that is needed, without having to engage the clutch pedal and without taking the foot off the accelerator. SAVINGS: Thanks to the electronic control unit, the Magneti Marelli robotized gearbox saves fuel by carrying out an optima gear change in relation to driving conditions, speed-engine revolutions. The system is based on a technology that is very different from the traditional automatic transmission which, on the contrary, tends to significantly increase fuel consumption. In fact, FreeChoice, allows a 4% savings in fuel on country roads and motorways and over 10% in city traffic. FOCUS ON THE ENVIRONMENT: lower consumption also means reduced CO2 emissions: the Magneti Marelli robotized gearbox is eco-friendly, as it allows a reduction of up to 5% in the emissions of polluting gases compared to vehicles fitted with a manual transmission. SAFETY: the robotized gearbox constantly monitors the transmission system, also preventing possible driver mistakes and avoiding improper manoeuvres and unwanted engine stops. Since drivers do not have to worry about shifting gears, they can fully concentrate on driving, always keeping both hands on the steering wheel. For all-round safety.